It is always a pleasure to meet Chefs who have worked in professional kitchens for decades and have trained with great Chefs in their journey. There is always something to learn from them seeing their food and work philosophy. Last weekend I met a Chef who hails from Naples and has trained under celebrity Chefs like Gordon Ramsay and Maurizio Morelli in his career spanning 20 years. Chef Vincenzo de Tuoro is the Chef de cuisine at Travertino, the fine dining Italian restaurant at the lobby level of The Oberoi, New Delhi. Travertino was launched in association with Hotel Hassler, Rome and the professional team at the restaurant is also recommended and placed by Hotel Hassler to maintain authenticity of the cuisine and the impeccable fine dining experience. How fascinating is that. You get to experience Italy in the heart of Delhi. 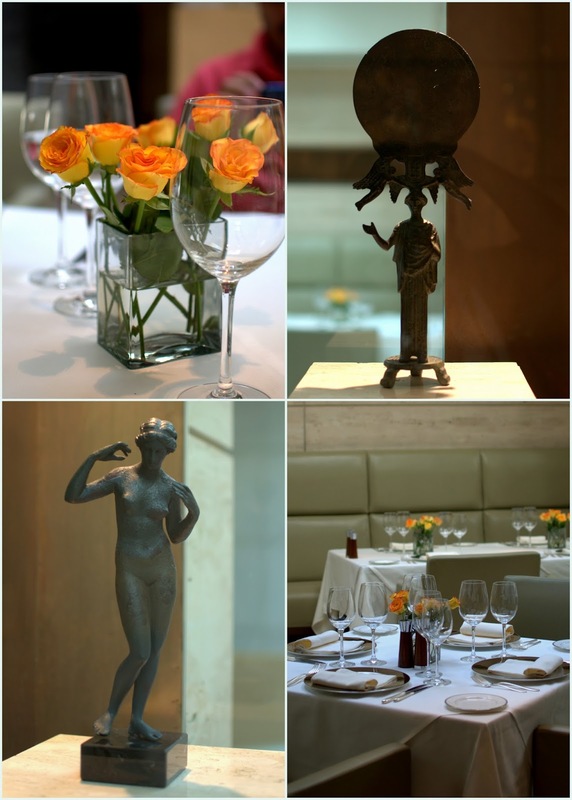 The restaurant gets its name from Travertine which is an Italian stone that resembles marble. Travertine is the theme of Travertino and you feel it in the accents all over. The detailing is very understated. And the food speaks to you softly. It still makes me happy even to think about what we had at Travertino. Chef Vincenzo came and explained to us the way he likes to combine fresh ingredients and colours in his food. We were to witness some invigorating uses of herbs and sauces, salads is leafy form and even in blended form. The sun dried tomato paste that came with the crusty bread was made with some roasted aubergines we were told and it was such a light and flavourful spread for the bread. 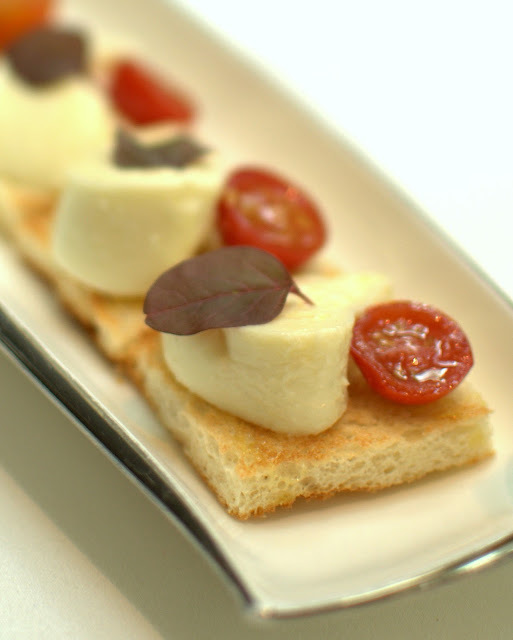 A very simple platter of crostini with just a fat slice of fresh burrata, half of a cherry tomato and a baby amaranth was served, it was simplicity doing justice to the fresh ingredients. Wonderful thought behind it I must say. Simpler things gave way to more complexity, more colour and more burst of flavours. 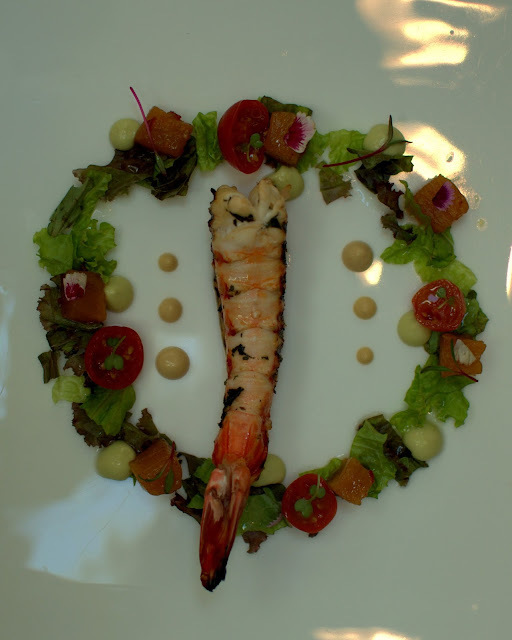 The grilled Kerala jumbo prawn came with a floral wreath of salad and drippings of onion-mustard and avocado based creamy dressing. Beautiful presentation and fresh flavours where you choose your flavours for each bite. Smear it with dressing, pick up the choice of greens, microgreens or even flower petals for salad and make your bite perfect, that kind of a platter it was. 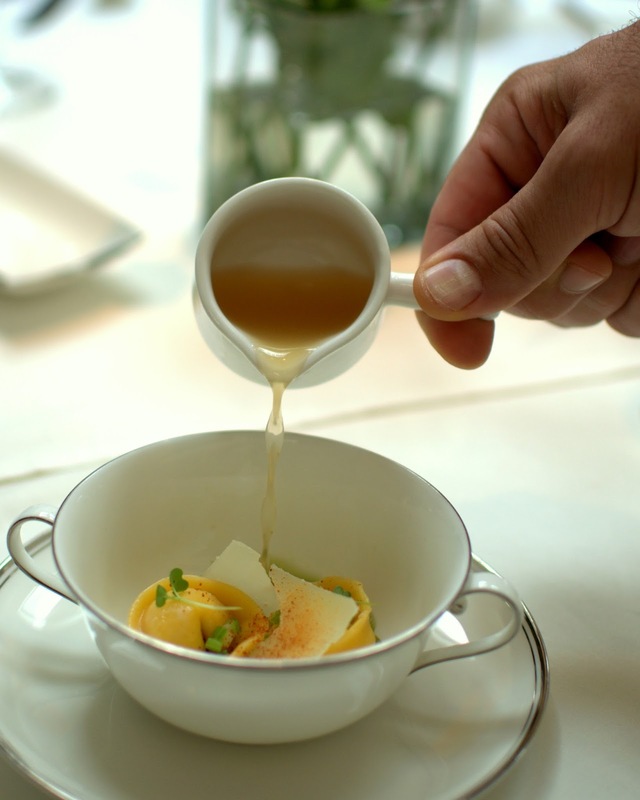 The Parmesan cheese tortelli came with a sprinkling of fresh celery and Parmesan consomme was poured over them. The best way to serve any stuffed pasta I feel, the celery was a fresh whiff with Parmesan. Next was Orecchiette with kerala prawns, crab shavings, beets crisps and some fresh dill. A warm broccoli and cabbage soup was poured over it and it became a medley of fresh flavours of dill with seafood. Pasta a teeny bit too al dante for my taste but great flavours. Pan seared Chilean Bass was served with a side of creamed broccoli and Pecorino quenelle. Some thin julienne of radish and carrot over the perfectly seared fish and a warm red cabbage soup poured over it. This was a treasure of flavours at multiple levels. The best thing is, Chef served very small servings for us on our request. That was a blessing because we did not feel stuffed after eating such a lavish spread. Their normal servings are mush larger. Travertino has a wonderful luncheon menu called Epronto which is a 2 or 3 course meal served quickly at a set price of 1700 or 2100 Rs plus taxes. 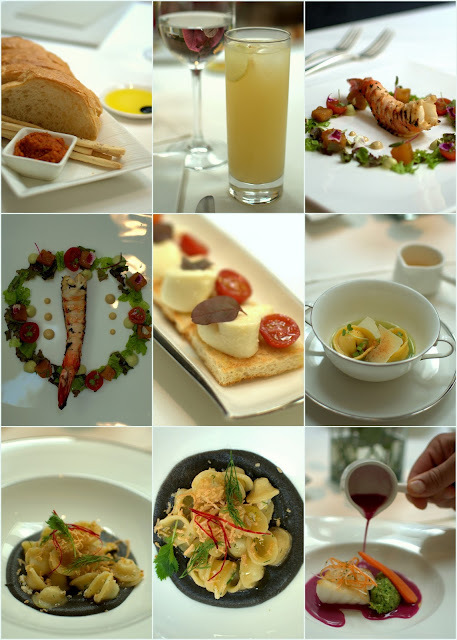 The Ala carte menu is quite extensive for relaxed meals. Desserts were served and we had to dig in. Tiramisu was indulgent and sinful, one of the best I have tasted. 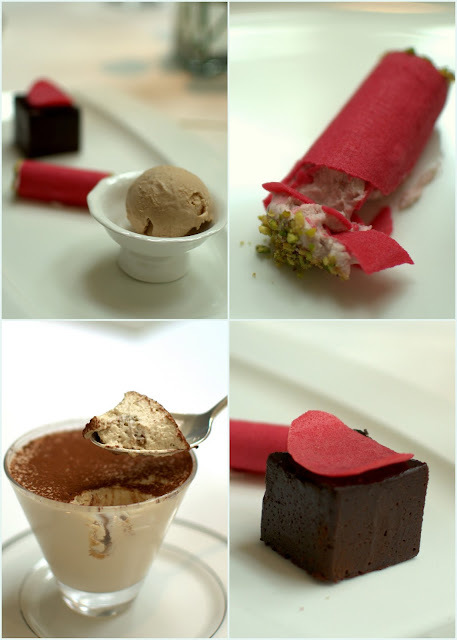 I loved the Hazelnut ice cream (home made) and the slow baked Belgian dark chocolate cake which was a dense and rich cake. The pink cannolo with raspberry and mascarpone was well done, but not my favourite. This is the place where you eat with all your senses and feel indulged even when you don't stuff yourself with food. Thanking Chef Vincenzo for the fine sensibility and this pleasant treat to us. 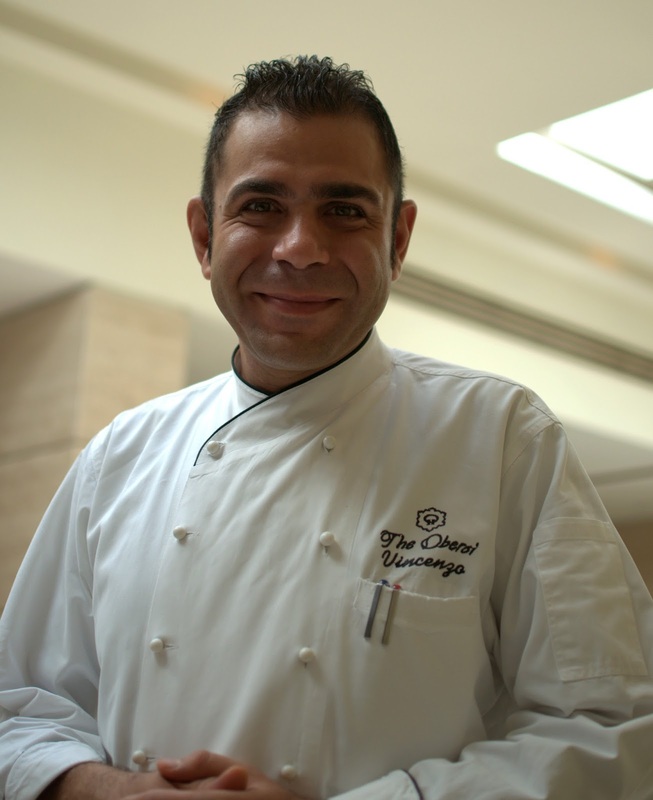 Chef Vincenzo conducts masterclasses too and I am looking forward to attending a few of those classes myself. It was a wonderful experience to talk to him about his way of cooking, using some fresh local ingredients and the best of cheeses, some imported and some procured locally. Would love to learn more from him in future.